What does it look like in your life when you are absolutely honest? Write out a vision for yourself…. “Only God can fully know what absolute honesty is. Therefore, each of us has to conceive what this great ideal may be–to the best or our ability. “Fallible as we all are, and will be in this life, it would be presumption to suppose that we could ever really achieve absolute honesty. The best we can do is to strive for a better quality of honesty. If anyone would have asked me if I am an honest person, of course I would have answered “yes.” This question of” what does it look like in your life when you are absolutely honest?” has made me think about something that I have otherwise always taken for granted. So, I want to thank the group for giving me this opportunity to really think about this, and take a look at myself in this area. It is helpful to examine the dictionary definition is for honesty. 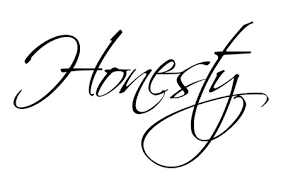 According to the dictionary, honesty is “fairness and straightforwardness of conduct.” It refers to “adherence to the facts, truthfulness, and freedom from subterfuge or duplicity.” Honesty is also connected to being “unquestionably authentic, genuine, real; free of ostentation or pretense; humble.” Honesty is also connected to the virtue to integrity, which is defined as “an uncompromising adherence to a code of moral values or principles.” When we are acting with integrity, we “avoid deception, expediency, artificiality or shallowness of any kind.” Thus, we are honest when our conduct is authentic, genuine, truthful, trustworthy, loyal, fair and sincere and we demonstrate integrity with all our actions. Within one simple word, so many other facets to our character are encapsulated. When we are dishonest, we are living in a delusion. When we are living under a delusion, we have a “false conception and persistent belief unconquerable by reason in something that has no existence in fact.” We are deceptive, fraudulent, insincere and untrustworthy. In the 4th step inventory, we learned that dishonest is “the act or practice of telling a lie, cheating, deceiving, stealing. Misrepresenting myself: lying by commission or omission. In what ways did I misrepresent myself by commission or by omission? “Dishonest” doesn’t just mean “telling a lie”; it can also mean—and for most overeaters who are people-pleasers” it does mean—“not telling the truth when the truth should be told”. We can harm people by not speaking the truth when it should be spoken, by letting the person to continue to do harm to other people, by letting them continue to do harm to themselves. The more a person does harm, the more that person harms himself or herself, and the more that person becomes less fulfilled, less of a human being. Using the 4 absolutes, in this case, honesty, gives us a means to measure our behavior objectively and without guile. The principles imbedded in the 12 steps operate on the belief that our actions are the result of our nature. When we are honest with ourselves about who we really are, not who we think we are supposed to be, we can take responsibility for our actions and how we respond to our feelings. Honesty, really, is a state of mind: a conscious daily practice and discipline to embrace ourselves as we truly are. When we are living in a state of conscious honesty, we practice accepting our true self, and enable ourselves to take responsibility for our thoughts, actions and behaviors. Why did we say what we did? Were we only trying to be helpful and informative? Or were we trying to feel superior by confessing the other fellow’s sins? Or because of fear and dislike were we really aiming to damage him? Do we really understand the people who are involved in this situation? Are we certain that we have all of the facts? Is any action or criticism on our part really necessary? Are we positive that we are neither fearful nor angry? Another way to phrase that: is it kind? Is it necessary? Does it need to be said by me? Does it need to be said now? The mirror image of honesty is self-deception, self-righteousness and rationalization. It is possible for us to use the alleged dishonesty of other people as a plausible excuse for not meeting our own obligations. Let us therefore continue our search for self- deception, great or small. Let us painstaking temper honesty with prudence and love. Let us never flinch from entire forthrightness whenever this is the requirement. Tell the truth, even if I am afraid or there might be consequences that I do not like. Identify, share and react without anger, without blaming others, without exaggerating, and without hurting the feelings of someone else. Keep a confidence of another person: respect their boundaries and our own, too. Be honest with other people or institutions property: do not take something that is not mine and return a lost object to its owner or the proper place. Know that the G-d of my understanding cares and wants the best for me. Therefore, I do not have to be afraid: He is always guiding me and I am never alone. He will always give me what I need and He always gives me what I need to pass any test that He sends to me. When I think about lying ask: what would the consequences be? How would this affect others? How can I improve my level of honesty? Make a commitment to tell the truth and honor it. Tell someone about your commitment and progress. Think before you give a dishonest answer, explanation, or reason. Be careful of when and how you use exaggeration, sarcasm, or irony. Be careful not to twist the truth or leave out certain parts. Don’t indulge in little white lies; don’t get caught in cover-ups. Watch out for silent lies. When you know about a lie and keep quiet, the lie lives on. When you catch yourself lying, throw your mouth into reverse and tell the truth. Five Ways to Become More Honest in Daily Living: To allow honesty to work in our lives, we must learn to practice it on a daily basis, no matter how insignificant the situation seems. Here are five simple ways to embrace truth in your daily life, allowing you to become more honest in your daily living. When faced with the consequences of your actions, it can be tempting to lie out of fear. Rather than focusing on not lying in tight situations, focus on embracing truth about your feelings and actions with yourself and others. You’ll find greater acceptance, and as your fear dissipates, you’ll be less tempted to lie in crucial moments. Honesty is about more than words. Practice fairness in every area of your life, and you’ll be less apt to desire to “beat the system.” Pay fair wages to those you hire, avoid padding expenses or work hours, reimburse others, and give to those who have given to you. Fulfill your obligations and responsibilities, and keep your promises towards other people. Make your word a part of your honor. This will make you less apt to make promises that are not in your best interest, and help create a reputation for honesty in your life. From the time we are young, we often learn to betray our own feelings and thoughts. Say what you mean in a loving manner. Don’t pretend or deny your true self. You will find that presenting others with honesty will become easier when you get into the habit of making your words count, and conveying your truth concisely and accurately to others. Excuses are the enemy of honesty, since they shirk responsibility and often do not cut to the core of a matter. Avoid the temptation to justify bad actions with excuses. Others will better understand where you are coming from, and you will be better able to improve your actions and performance in work, relationships and art as a result.